Branko goes beyond the Jaws of Death, originally uploaded by Mic2006. Yesterday was living proof (thankfully), that caving is more about the brain than the body. Branko, Ricci, Jeff and I explored an Ontario cave that has long attracted a certain kind of interested adventurer, but has kept something of its true extent hidden to all but the most dedicated explorer. Branko – a large man (well over 6 foot with a sturdy frame) squeezed through a tortourous gap that he called ‘the jaw’ to access thus-far remote and difficult terrain. See video of Branko going beyond the Jaws of Death getting stuck underground, here. In returning back from his incredible exploration Branko become momentarily stuck underground in a situation that an ordinary person would have found appalling. Again – mind over body, where most would have been contemplating a gloomy future of hypothermia and eventual death beneath a cold, grey bed of rock, Branko found it within himself to think logically and calmly, resting and practising relaxing techniques to ensure that panic did not swell his muscles. As Branko said, “This is between me and the rock”. And in the end Branko seems to have negotiated his way beyond the impasse and returned to the surface unscathed. At the bottom of the sinkhole; A deep mysterious pit in Ontario, Canada, originally uploaded by Mic2006. This weekend Jeff and I descend to the bottom of a cold and dripping sinkhole in Ontario, Canada. It would appear that most are unaware of the existence of these pits, thinking that they only occur in Florida and other places where there have been some well publicized swallowings of people and posessions. Sinkholes occur for several reasons, but in stable rock they develop slowly and predictably over thousands of years and it is only the careless who end up lying broken and dying at their bottom. In Toronto, it is most likely an underground pipe that has broken and eroded the lake deposited sediment beneath the city streets that would pose a sinkhole hazard. On rare occasions there have been collapse windows that have unexpectedly appeared in farmer’s fields, and of course there have been the celebrated cave-ins around mining communities like Cobalt and Kirkland Lake that have resulted in the loss of buildings. I believe it was in Timmins that a school bus was swallowed up one night with a sleeping beggar who had sheltered there, little suspecting that he would wake up entombed within the earth. See the Documentary video on the sinkhole that we had explored this weekend – a Deep Mysterious Pit in Ontario Canada – here. 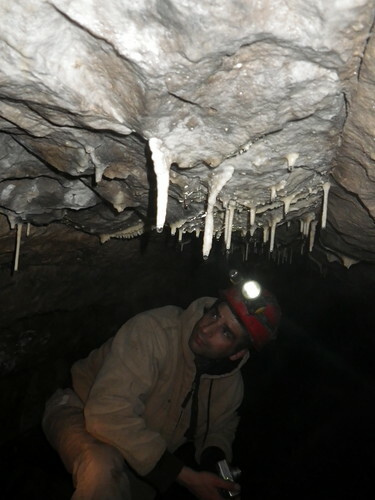 I spend my weekends caving and it appears that for the scarcity of horizontal cave openings near Toronto, it is now the vertical shafts that we are breaking open in hopes of exposing buried tunnels. Pictured here is one such shaft that sinks deep into virgin rock. Cenotes in Tulum, originally uploaded by Mic2006. In case you were wondering why I stopped posting, I’ve been in Tulum for the last little while – exploring cenotes and just generally enjoying the culture of the Yucatan. 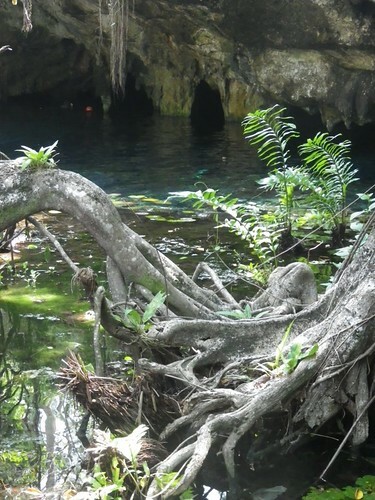 Check out this video on some cenotes near Tulum here. we stayed in our usual hotel, the Punta Posada Piedra, spent time learning Spanish from Santiago, the night watchman, watched turtles crawling up on the beach to lay eggs – and one that changed its mind. We visited the Sian Ka’an Biosphere Reserve and to me, most significantly visited several local cenotes and snorkled in them. Cenotes that I have documented on the video link above are Gran Cenote, Cenote Calavara (Temple of Doom), Manati Cenote and Dos Ojos. Of course there are plenty of others, but those are the ones that are most easily reached from Tulum. Prometheus – A cave that looks like Aliens, originally uploaded by Mic2006. Today we busted open a tunnel in cave that we had thus far called the Void, it was somewhat nondescript, but Martin Davis said that he had seen a small passage when he visited the area 30 years ago. Well after exploring a nearby shaft on cable ladder (video on that later in the week) we went over to the void and began digging where we thought the water must go down. We worked on clearing a plug of leaves and sticks. After about an hour the front digging wall fell away and the floor started collapsing and there in front of us was a passage that was fantastically ribbed – as Greg said, it reminded him of the trailer for that new movie Prometheus. So we have decided to rename the cave Prometheus, and of all coincidences, I got home to learn that my son was hoping to take me to that movie next weekend – obviously the cave was destined to be named this. If I recall correctly, was Prometheus not the Greek hero who bought fire to man and for his efforts had his liver torn out by an eagle? Anyway Jeff has a theory that this is a feeder passage to the main tunnel that we are yet to unearth. I think there is a possibility that this is possible. I have been trying to determine from my picture of the scallops which way the water was running. I recall last weekend I copuld hear water rumbling away beneath the rocks in an area that was quite different from where we dug to open this passage. Hopefully within a day or two I will have some video up on the initial opening of Prometheus, and maybe some video of aliens – actually no – I’m gonna sell those to News of the World. Creepy Tree , originally uploaded by Mic2006. Looking for caves we spent a long hot day slogging through the forest near Toronto. The bugs were really bad and we were pretty much disoriented for a significant part of our search. Jeff had located some deep conical sinkholes on a high-rez aerial photo. It appeared that here were 4 or five of these pits somewhere out in the bush. we began by following fields, then a fence line that disappeared in the forest and then finally, just us, the mosquitoes and a bear. 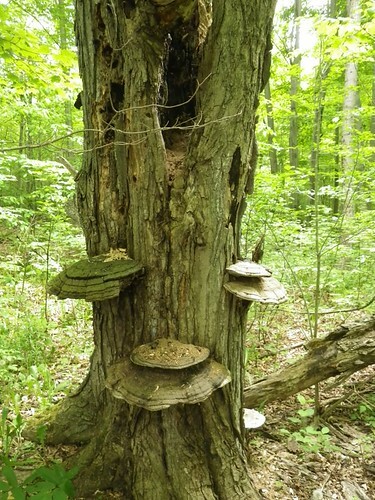 Not having drunk enough water, this creepy looking tree seemed to have qualities other than just natural ones. I imagined it as some sinister kind of entity, inhabited by all sorts of odd figments of my imagination – but sinkholes and finding caves, were those a figment of our imaginations? 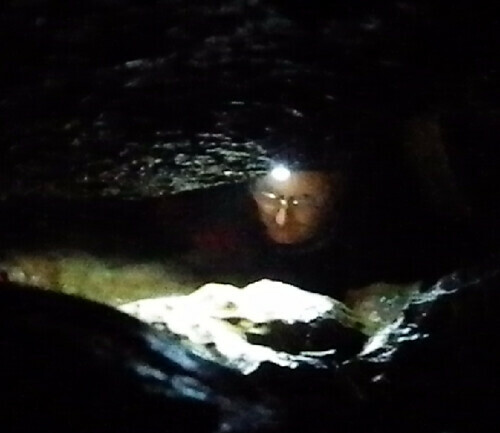 See video of our day of cave hunting here. 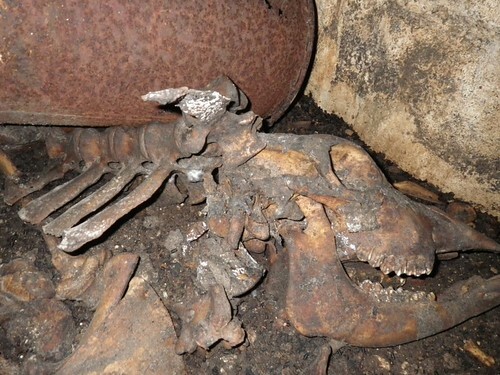 Death Bell Cave; Real Horror Show, originally uploaded by Mic2006. We descended by cable ladder into the cave that we call the Death Bell. That morning we had no idea what we would find. My greatest fear was rattle snakes. I have come across the Massasagua rattle snake in caves before, but being in Ontario, we are fortunate that the Massasagua is the only poisonous snake. 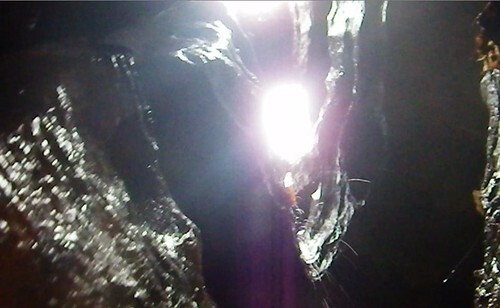 We cleared loose rock from the lip of the shaft and Greg joked that it was like an episode from the X – Files where Skully and Mulder found the black slime alien in a cave much like this one. See video on the Death Bell here. As we followed into the cavern – down the swinging ladder it soon became apparent that this shaft was like no other that we had visited. You step off the ladder onto a boulder that is perched atop a 10 foot high mound of bones. Some of the bones were those of animals likely thrown in, along with some garbage from a nearby farm, but by the size of the mound you would imagine that it would have taken thousands of years to grow and depending upon the initial depth of the shaft, the pile might go down well beneath ten feet. A tunnel led off at the deepest point, following downward along a joint. I crunched through a sediment of tiny black nuggets similar in appearance to charred rice. A puff of wind blew from the terminal pinch-point. Possibly the tunnel goes onward, but it has been blocked by the crunchy fill-in. I believe it must be the casings of a thousand years of maggots that have feasted on the ever-growing heap of corpses from fallen animals. I am optimistic that this is a solution cave as opposed to a sea cave. Sea caves in Ontario; Rover Cave or Grieg’s Caves for example are generally wide mouthed and narrowing like a funnel. This cave seems to have no surface connection but the porthole in it’s roof, and that hardly provides a suitable portal for erosion. Whatever the case, an animal that falls in to the Death Bell is doomed to a slow and lingering death – there’s no way out. And for a human, much the same without a ladder.